The weather has been kind around the end of December and so we managed a good couple of days work in the garden to end the year – to my untrained eyes at least it makes quite a noticeable difference. After all the wet weather and the lack of any decent chance recently for things to dry out I wasn’t sure when we started that anything constructive could be done though. 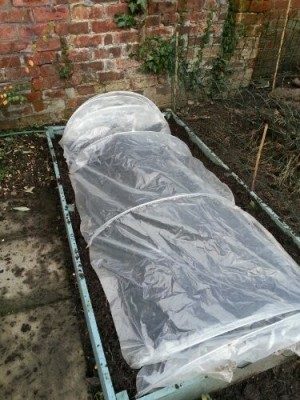 Luckily a little bit of weed control fabric and some strategically placed cloches seem to help bring things together on the veg beds at least. We are already starting to see some shoots coming through which I guess must be the snowdrops so I need to keep the chickens off those flower beds if I want to see them grow! 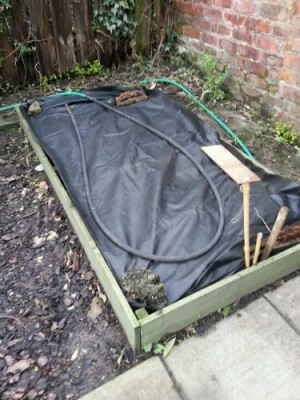 Now that the leeks are all harvested and eaten all 3 veg beds are now tucked up for a couple of months while I try to decide what to do next year. 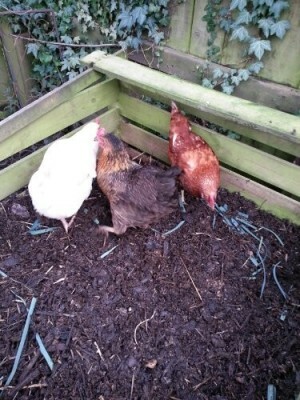 And chickens really enjoy it when you dig over the compost heap, in this case I was redistributing the contents of the current compost heap and adding a little of the contents from an older heap to liven things up. I can’t help thinking that the chickens will have cleaned out any worms that I managed to transfer though so maybe the effort was wasted. What to try in 2013? We are still hoping to sell the house in the early part of this year so there aren’t any major plans for the veg beds but I can’t just leave them empty. Maybe a quick peek in the seed catalogues and some fancy planning with a calendar will throw up some ideas for vegetables that are happy with early planting and give a quick harvest? Of course there are always a few pots of various sizes dotted around which I could plant up and then if necessary take with us when we move so maybe all is not lost!